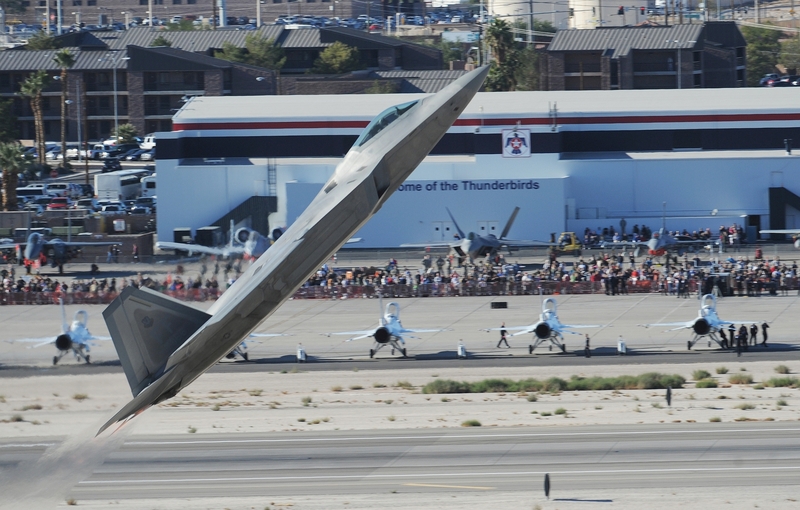 A couple of years ago I was able to attend the air show at Nellis Air Force Base in North Las Vegas. I stood just behind the fence, no more than 150 yards from the center of the runway, as an F-22 flew an amazing demonstration. In fact, in the picture above, I was standing about 200 yards to the left of the left edge of the frame, maybe less. We were there two days, so the second day, I made sure I positioned myself just about where I thought the plane would rotate into its climb. The photo above is significantly better than any I could have taken, for two reasons: first, the photographer was located in a restricted area, somewhere on the other side of the runway, where civilians couldn’t go. This put him with the sun to his back. Second, he probably has WAY better equipment than I did. My camera was pretty good – I goot some pretty good zoomed images – but no long lens like this. So as the pilot pulled the nose up – maybe not so much as vectored the engine thrust up, pushing the tail down – the plane really did seem to stand on its tail. It was an amazing sight. I’ve heard that when other countries join our pilots for exercises like Red Flag, we don’t take the F-22s out any more; it’s just too much of a turkey shoot. Yeah. And we stopped building them. We don’t need them, of course. It’s not like, oh, the Chinese, or somebody, might be building a plane that could compete with it in the air. Sheesh. Dang short-sighted congresscritters. 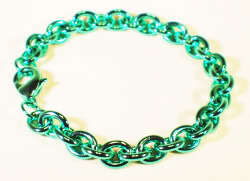 It’s supposed to be a reproduction of the bracelet Hank Rearden made from the first pour of Rearden Metal in the novel “Atlas Shrugged.” In the book, the bracelet is the same color, pretty much, kind of a blue-green steel alloy with copper in it. However, it wasn’t supposed to be this pretty- it was made by steel foundry workers, after all! I talk more about it on the Keep Americans Free blog posting here. You are currently browsing the The Old Gray Cat blog archives for the day Friday, February 18th, 2011.